Northwest Territories Power Corporation workers will join government of the Northwest Territories workers in a general strike Monday if talks between the Union of Northern Workers and the government fail. 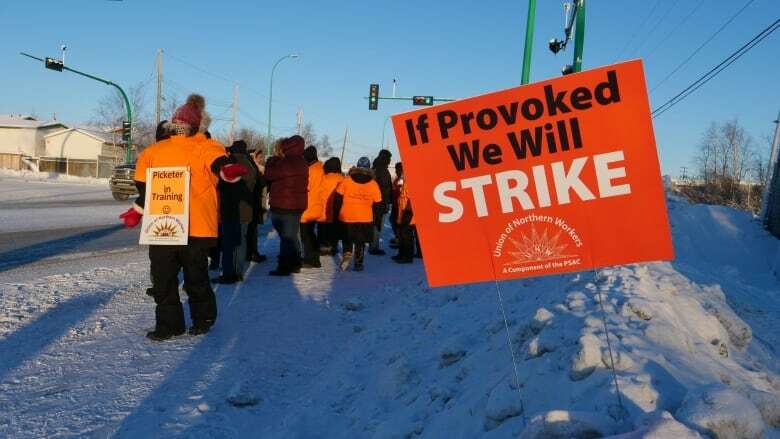 Workers with the Northwest Territories Power Corporation have served notice that they will join Government of the Northwest Territories workers on the picket line Monday if negotiations this week between the Union of Northern Workers (UNW) and the government fail. In a press release Wednesday afternoon, the union delivered formal strike notice on behalf of power corporation workers. If the union and the territorial government are unable to reach a tentative agreement by the end of the weekend, workers will undertake a general strike starting Feb. 11 at 12:01 a.m. The union says it would drop its plans to strike, if the territory would agree to binding arbitration to settle the dispute. "As we have said all along, we will leave no stone unturned in our efforts to avoid a strike," stated Todd Parsons, union president, in a press release. "We even offered to sacrifice our right to strike, if the NTPC and the government agreed to binding arbitration. This offer still stands." Last month the territorial government rejected an offer of binding arbitration with government and power corporation workers. Union workers have been without a collective bargaining agreement since 2016. In the N.W.T. Legislative Assembly Wednesday, MLA Julie Green asked if the government, in order to avoid a strike, would commit to binding arbitration if negotiations scheduled for later this week fail. Robert C. McLeod, the territory's minister of finance, said he didn't want to presuppose negotiations would fail. "We are going into mediation this weekend," he said. "We would like to see an agreement that benefits the UNW, the GNWT [Government of the Northwest Territories] and … people across the N.W.T." Green and MLA Kieron Testart gave the legislature notice of a motion that will call on the government to enter binding arbitration over the weekend. The motion will be debated and voted on, on Friday. A strike vote last year was supported by 70 per cent of UNW members who voted. Until now, the number of members who took part in the vote was not disclosed. According to Frank Walsh, union local 11 president, it's likely 50 to 55 per cent of the entire union membership took part in that vote. "To the best of my knowledge — I can't say that I have that exact number because I don't — but to the best of my knowledge … a little over 50 per cent would kind of be accurate," he said. Walsh said the union is not optimistic a deal will be reached in time to avoid a strike Monday.